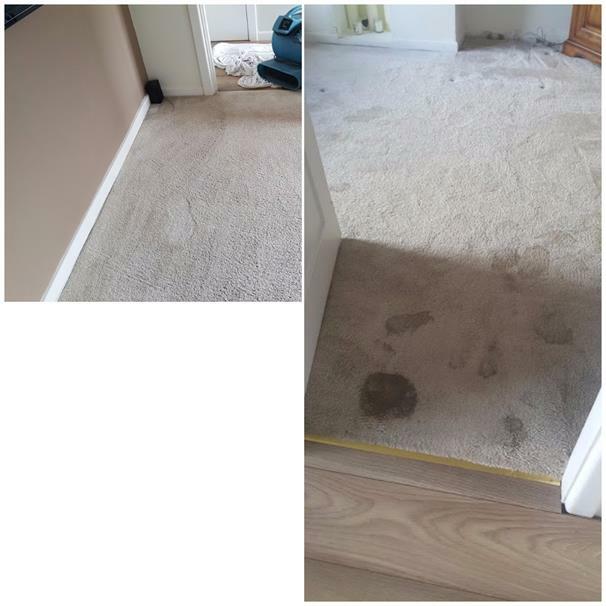 o	Dog and Cat Urine from Carpet and Rugs. o	Smell of urine from carpet, couch and Rugs. o	We Use UV light to Spot Urine. With one in three of the Uk households owning a dog, cat or pet, there's very little doubt we are a country of animal lovers. straightforward cleaning, but major restoration work. distasteful odour and smell that lingers around till something is done to completely resolve the problem. contaminating the carpet backing and flooring sub straights below the surface. top urine liquid evaporates and dries, the urine odour and staining will become pungent and concentrated. high in the air the crystal will dissolve and smell very bad. immediately begins a chemical reaction that destroys the urine odour. the bulk of the urine crystals. In the extreme cases, we may need to pull back the carpet, the underlay may have to be removed and replaced. carpet backing. It may be necessary to apply this product heavily enough to dampen all areas affected by the urine. Over the next 24 to 36 hours, our chemical will react with the urine, and break down the odour causing components. If you love your pet, you will love our Pet Urine Removal Treatment.